Have a lot of waste that needs to be removed? Are you in need of an expert rubbish clearance team? Well look no further because here at Diamond Waste we offer this service with first class customer service and a great price to match, we are the most trusted companies in the area as we have been in the sector for a number of years now. We operate in London, Surrey and Kent. 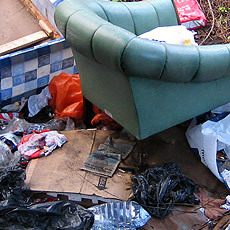 It doesn’t matter how much waste needs removing, as we have teams of multiple people to carefully remove the waste from your property. We also offer same day clearances for those that need waste removed fast. Next day and weekend appointments are available too. If you are unsure about anything then do not hesitate to contact us. Our team of highly trained experts have been in the industry for a number of years and have the experience to help you throughout the process. Make your booking. We handle everything for you, including the removal and loading of waste. We carry out all our services to the highest of regulation standards ensuring that all waste is disposed of safely and in an environmentally friendly manner. If you need your waste cleared, contact Diamond Waste today.